The Hudson was an American-built light bomber and coastal reconnaissance aircraft built initially for the Royal Air Force shortly before the outbreak of the Second World War and primarily operated by the RAF thereafter. 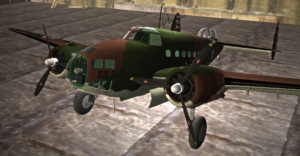 The Hudson was the first significant aircraft construction contract for the Lockheed Aircraft Corporation—the initial RAF order for 200 Hudsons far surpassed any previous order the company had received. The Hudson served throughout the war, mainly with Coastal Command but also in transport and training roles as well as delivering agents into occupied France. They were also used extensively with the Royal Canadian Air Force’s anti-submarine squadrons and by the Royal Australian Air Force.